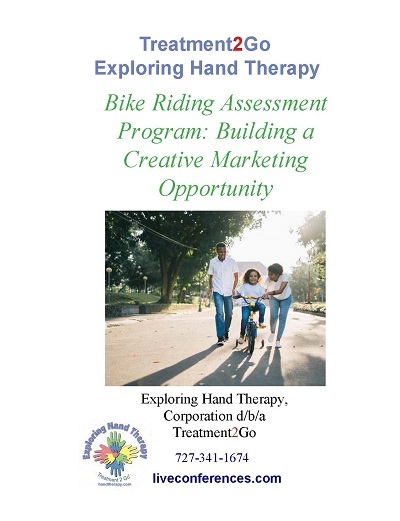 This course provides instruction on how to assess and teach bike riding skills as well as how to market and prospect clients. This course offer you a unique opportunity to learn new skills coupled with exposing you to a unique way to market your therapy business. After taking this course you will know how to perform a task analysis of bike riding skills as well as teach participants to ride a bicycle! On a more global scale with the use of a bike riding program you will be able to identify potential clients via your keen skillset. Identify appropriate helmet fitting and safety awareness goals: sizing, positioning, fitting, size adjustment dial, safety education/demonstration strap adjustment. Identify when the client is able to progress or regress through bicycle riding skills. Determine the most appropriate bicycle based on clients' size and abilities. Recognize the developmental deficits as they pertain to bicycle riding. Differentiate between balance, motor planning and visual motor integration when performing bicycle training. Review sensory systems (vestibular, tactile, proprioceptive), bilateral integration, visual tracking and reflex integration as to how they will used in to identify clients who are appropriate for Occupational Therapy services.